Music is the food for the soul. More than just a form of entertainment that keeps us company when we are on our own; it also sets our mood and affects our emotions in the conduct of our lives. This is why listening to music is one of the most utilized features of our Android phones. Over the years, music has evolved with the advancement of mankind. Digital technology has made music more portable and easily accessible to people. Today, most of us listen to music through our phones or digital devices which has overtaken the traditional way of storing and selling music via vinyl, cassette or CD. The digitalization of music has created two modern ways of how people listen to music namely by downloading and streaming. The former pertains to the process of transferring and storing digital audio files in your device such as a phone and playing these files. The latter refers to listening to music directly from its database or source which would require an internet connection. An offline music player is an app specially designed to play downloaded musical files stored in your phone. An online music player is an app that you use to stream music via the internet. Some apps support both downloaded and streaming music. In any which way you listen to music, you will definitely need a music player or app to play digital music. Following are 8 of the best free offline music apps for Android phones. When it comes to playing digital music, Spotify is the most prominent app of choice. In fact, its name has become synonymous to digital music. What makes Spotify the leading offline music app is it basically provides all features needed by any average music junkie. It’s not just a free app. It allows you to listen to music for free. 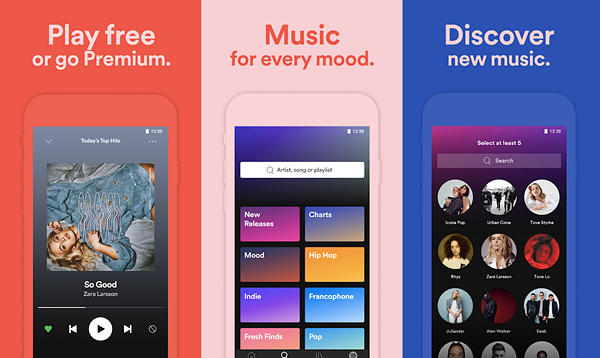 It provides a free subscription plan that allows anybody with an Internet connection to enjoy music without paying and without those annoying ads in the middle of a song. As one of the best offline music player apps in the world, it sets the standards for what a music app should be, such as compatibility with different gadgets; access to music from all genres and countries; searching features by artists and by song, personal playlist creation, and the ability to download music. Only the premium version allows you to download music so that you can listen to music offline even without an internet. In as much as music is needed by any person, Spotify has also become a necessity to any Android phone user. 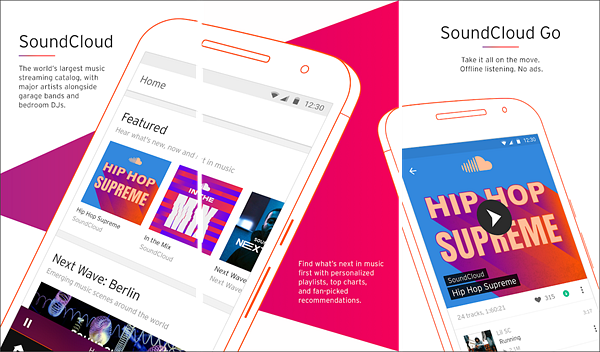 Soundcloud is a complete offline music downloader app that caters to music lovers. And by that, we mean both music listeners and music composers with its family of different SoundCloud products that offer a variety of features beyond listening pleasure but also for uploading your original compositions and sharing them publicly. Aside from the traditional function of downloading musical files and playing them, it provides you the ability to upload your own material and disseminate them, which is perfect for budding artists. Aside from getting access to mainstream music, you also get fresh material from non-commercial and indie artists. This free offline music app also provides daily recommendations of music based on your preferred taste or genre. Hence, it allows you to discover new music that is still behind the veils of anonymity. With its growing community of users who are themselves, musical artists and performers, SoundCloud prides itself of being the largest music and audio streaming platform in the world. And it continually expands to this day. If there is anybody who would know how to create the best free music app for Android phones and gadgets, then that would be the creator of Android itself. 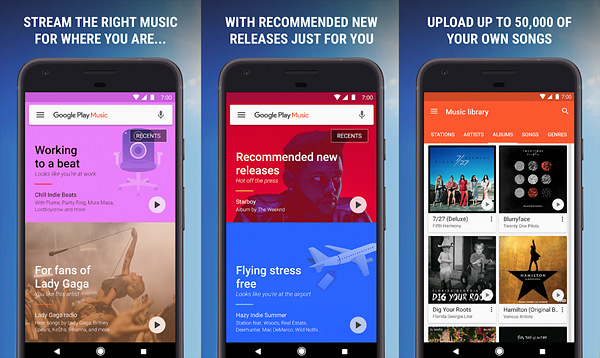 Google Play Music provides free, ad-supported radio and music from all genres, which you can browse and search by artist, album, genre, mood, generation, and more. You can upload your own music collection and play them with this free offline music player. Google Play Music provides you the typical functionalities of a great music player app. To make music free, streaming would include ads. However, what makes this app still great is its effort to make music more affordable to users. It offers a family plan which allows up to six people to enjoy their different music on demand on their individual phones with one subscription. This subscription also allows you to download music and listen to your sounds even without being connected to the Internet. 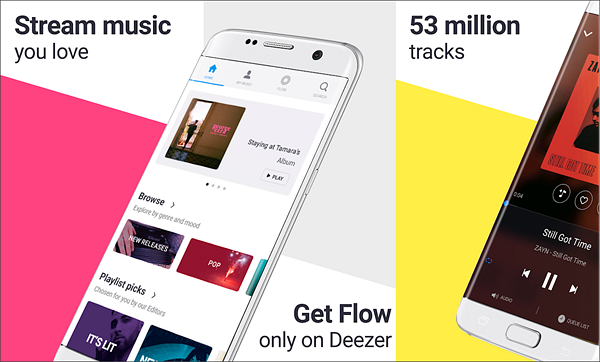 Whenever you stumble upon reviews or recommendations of top offline music apps for Android, Deezer is one app that is never absent on the list. This is because it essentially has all the basic and major features of the top rated offline music apps from convenient searching for your favourite artists and songs, creating your own playlist, singing along, discovering other music, downloading music for offline listening and even the cut-rate paid version. The sound quality is great for any average musical listener. But it still offers enhanced sound and audio quality when you buy its premium version. Musicolet is an impressive music app that is purely offline. This means that it does not support music streaming or downloading. While it does not require the internet to operate, it requires you to have your own music files in your device to play. This free offline music app focuses on functionalities that support your listening pleasure of music that you own. It helps you create multiple queues which are like creating different personalized soundtracks/collection. It integrates well with earphone controls. It has a built in equalizer for you to customize the audio quality based on your preference. And it has a simple graphical user interface for easy navigation. 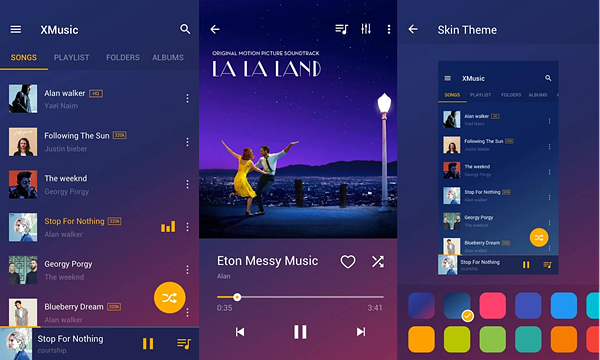 Dubbed as one of the best music players for Android, Music Player is also a purely offline music app designed to play all music files in your Android device. 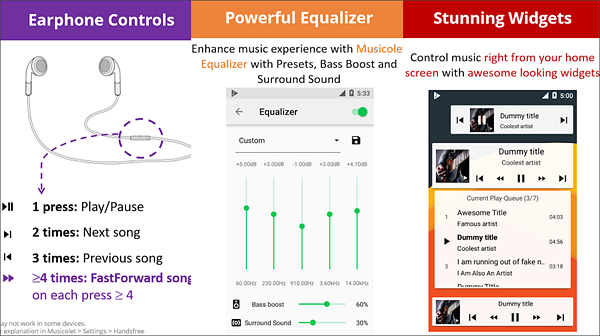 What makes this app powerful is its ability to play practically all types of audio formats such as MP3, AAC, FLAC, OGG, APE, AIFF, WMA, MIDI, among many others. Regardless of format, Mp3 Player will play them in high quality, which is further complemented by a chic equalizer for a customized base, mid and treble tones. And to keep you up in style, this offline music player comes with different modish layout and themes. This free music player is principally designed as your gateway for streaming music from radio stations, channels, and podcast available in the Internet. You can get access to thousands of local and international radio stations from around the world. How cool is that? And there are various playlists to choose from prearranged by mood, activity, generation, and genre to allow you to play that fitting soundtrack at the moment. 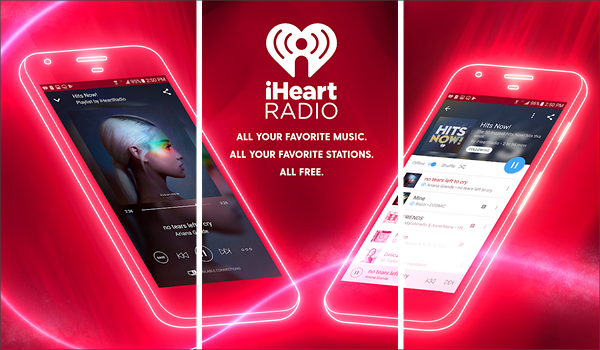 As an offline music player, you can easily switch iHeartRadio to offline mode by tapping the switch next to the “Offline” indication. Once initiated, you can now play your favourite songs stored in your device. 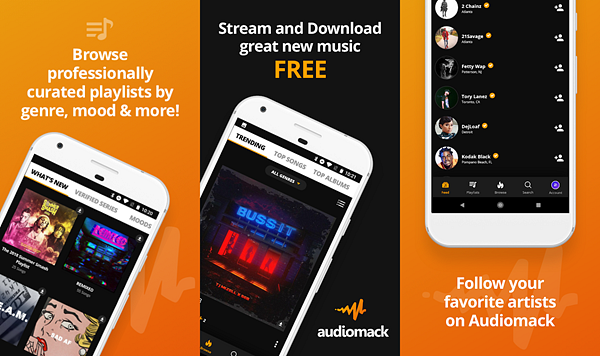 Audiomack is one of the famous offline music downloaders for Android that made for streaming and downloading songs for free and playing them offline for free. How else can you beat that? Audiomack is also ideal for music artists to share their masterpieces to the public. While it is a stand-alone offline music player, it is also designed to integrate with other music apps such as Spotify, Google Play and Soundcloud to complement their features. You can download all these apps in your Android phones for free. However, you need to upgrade and pay for their premium versions to unlock their full functionalities and features. As offline music players, however, you would always need your own music files stored in your phone to listen to music offline. With the free availability of these music players, the best things in life are indeed free. For music lovers, nothing is more annoying than deleting or losing one or more downloaded songs by mistake. Here, I recommend a practical tool, which is Gihosoft Free Android Data Recovery Software. 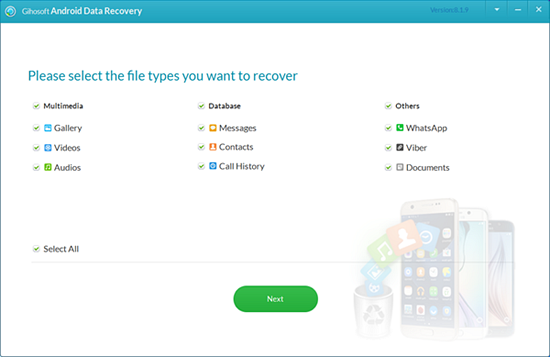 With this software, you can quickly retrieve files you deleted before, whether it is music, video, photos, contacts, text messages or WhatsApp chat history.